This post is sponsored by Mirum, but all opinions expressed are my own. With the cold weather that has settled in over the last few weeks, I’ve been drinking tons of hot chocolate. It seriously feels like every time I come indoors my fingers are frozen and I’m in need of the perfect way to warm up. While I personally think a warm cup of hot chocolate is the perfect way to make any cold day cozy, I’m also a believer in experimenting with flavors and taking my hot chocolate creations to whole new levels. While a warm cup of cozy hot chocolate is a welcome way to warm up, right now I’m personally crushing on a warm cup of deliciously simple Raspberry Hot Chocolate that pairs the milk chocolately taste and aroma of Swiss Miss that I crave with an easy homemade raspberry syrup. So, why will you fall in love with this easy and delicious cup of chocolate and raspberry perfection? Well, quite simply it’s the most delicious way to warm up all winter long! 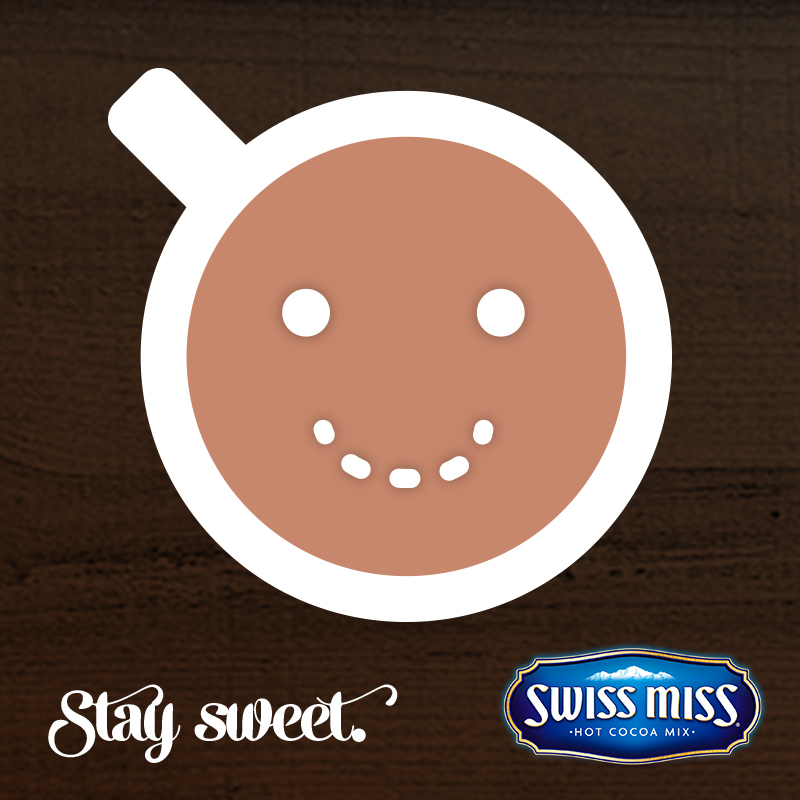 I’ve known for quite a few years that there’s a smile in every sip of Swiss Miss milk Chocolate Flavor Hot Cocoa Mix. Since it’s made with real cocoa and real nonfat milk, it’s the quickest, easiest and most delicious way to get comfort in your cup while sipping away on the chocolatey taste you crave. Plus, since it has no artificial sweeteners, preservatives, flavors or colors and is only 160 calories per serving, it’s a cup of cozy that I can feel good about sharing with every member of my family. And do you want to know the best part? Right now I can get a 30 count box of Swiss Miss Milk Chocolate Flavor Hot Cocoa Mix at Walmart that has 30 (1.38) ounce envelopes of hot cocoa mix inside. While I’ll be the first to admit that a plain cup of Swiss Miss Milk Chocolate Flavor Hot Cocoa Mix made mixed with water or milk is pretty much perfection, I recently discovered the mixture of chocolate and raspberries and decided to give my cup of hot cocoa a twist that’s worth falling in love with any time of the year. 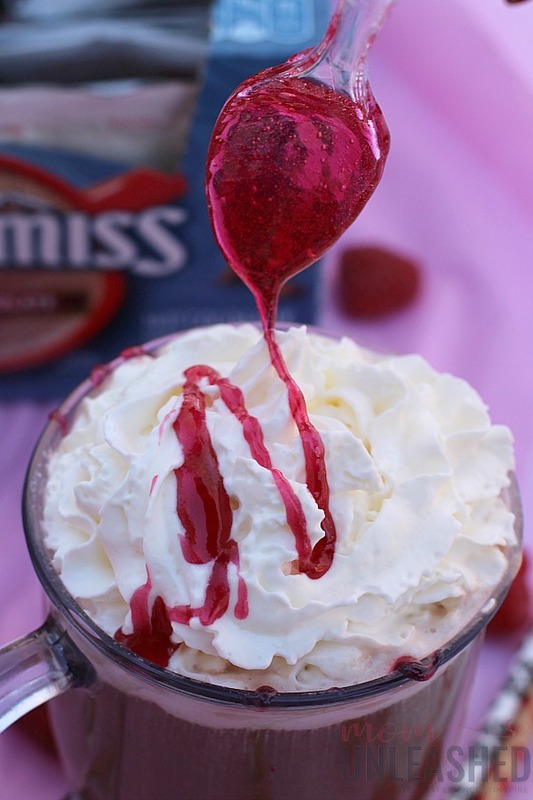 To make it I simple took the perfection of Swiss Miss and paired it with a simple homemade raspberry syrup to create a warm cup of cocoa that has an unexpected burst of raspberry flavor. Let’s make it! 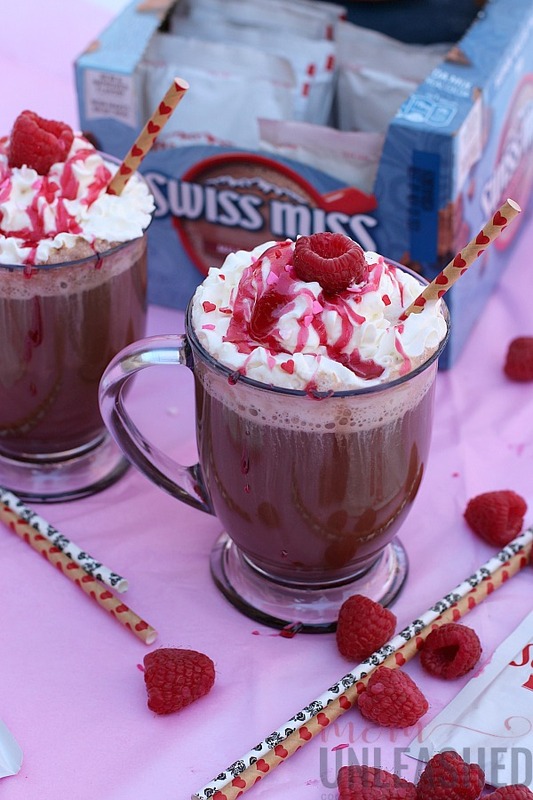 This Raspberry Hot Chocolate pairs the chocolatey taste of Swiss Miss with homemade raspberry syrup to create a warm and cozy drink that's perfect any time of the year. Add the raspberries to a sauce pan and cover them with the water. Bring the raspberries to a boil and then reduce heat to low and simmer for 25 minutes. 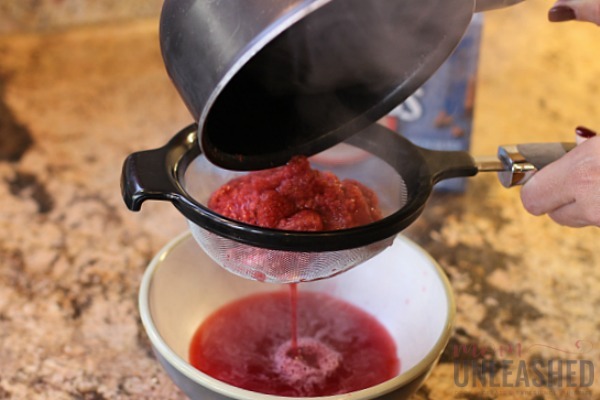 Separate the liquid from the cooked raspberries using a strainer. Add the liquid back to the sauce pan and add in the sugar. Bring the mixture back to a boil and them simmer for about 10 minutes or until semi-thick. 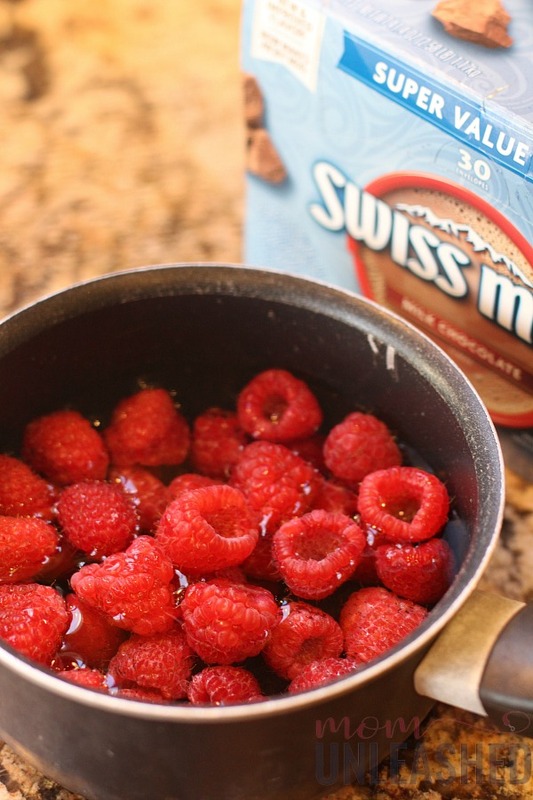 Pour one Swiss Miss packet into each cup. 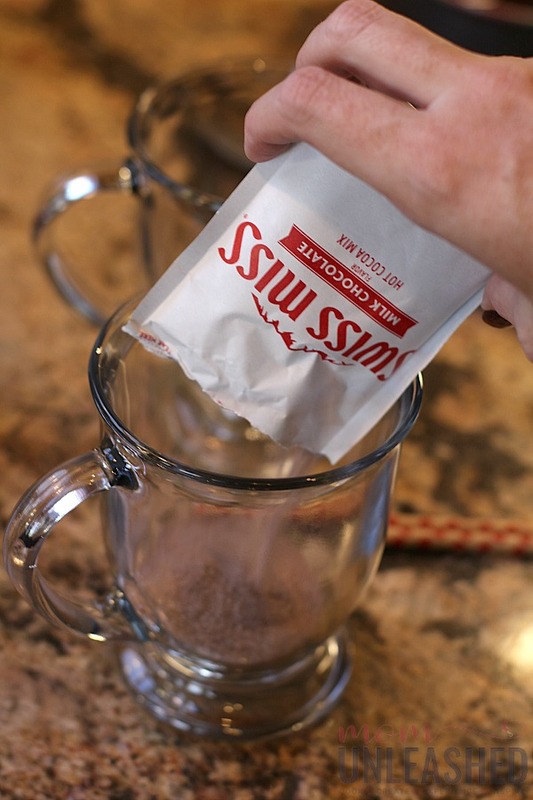 Pour 1 cup of hot water or milk over the Swiss Miss mix and stir. 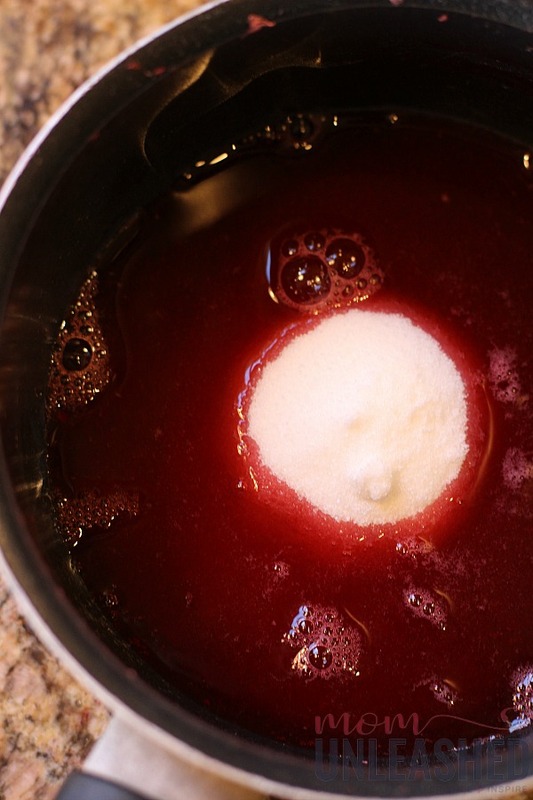 Add one tablespoon of raspberry syrup to each cup and stir until well combined. Top with Reddi-wip and drizzle with raspberry syrup. Garnish is a fresh raspberry and sprinkles if desired. This simple Raspberry Hot Chocolate is so easy to make and while it’s a perfect color scheme for this month, it’s really a warm cup of cozy that’s perfect for any time of the year. To start, I needed to make my raspberry syrup and it’s actually pretty simple. To make it, I added my raspberries to a sauce pan and covered them with water. After bringing my raspberry and water mixture to a boil, I reduced the heat and simmered the raspberries for about twenty five minutes. Then I poured the mixture through my strainer to separate the liquid from the pieces of raspberries. After adding the liquid back to my sauce pan, I poured in my sugar, brought the mixture back to a boil and then reduced the heat and cooked it on low for about ten minutes, just long enough for the raspberry syrup to thicken. 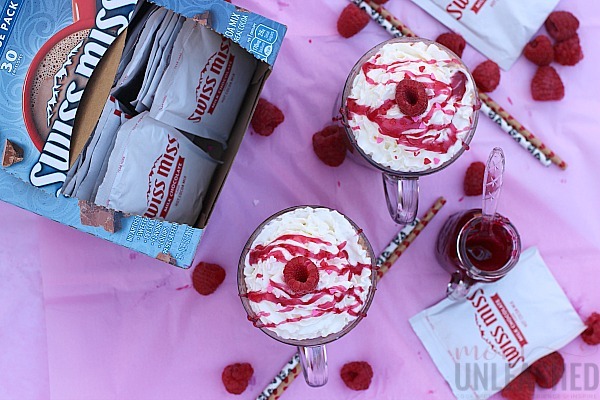 Once my raspberry syrup was ready, I pulled out my Swiss Miss Milk Chocolate Hot Cocoa Mix packets that are made with premium cocoa and nonfat milk and added one packet to each of my cups. After warming my milk (you can use milk or water), I poured one cup of milk into each of my glasses. Then all I had to do was stir and my perfectly made hot chocolate was ready. Now, truthfully I could have stopped my hot chocolate drink here and it would have been delicious but I was all too ready to incorporate my raspberry syrup and really take this mug of deliciousness to the next level. To do this I added one tablespoon of my raspberry syrup to each of my cups of hot chocolate (*Note: the raspberry syrup will thicken as it cools but the heat of the hot chocolate will help it liquify so that it mixes in perfectly). Once I had stirred my raspberry syrup into my Swiss Miss Milk Chocolate Flavor Hot Cocoa, all that was left to do was add a few garnishes and my Raspberry Hot Chocolate was complete. Since I’m a firm believer that hot chocolate NEEDS whipped cream, I pulled out my Reddi-Whip and swirled it onto the top of my Raspberry Hot Chocolate mixture. Then I took more of my raspberry syrup and drizzled it over my whipped cream for additional raspberry flavor and because, well, it just looked gorgeous! Finally, as a finishing touch, I added a fresh raspberry and some sprinkles to the top of my Raspberry Hot Chocolate to complete the look and compliment the gorgeous color of the raspberry syrup that take this mug of hot chocolate to new levels. After adding a straw (I just happened to have some really cute ones that had red hearts that paired perfectly with my red raspberry syrup), my Raspberry Hot Chocolate was ready to enjoy. Trust me when I say that whether it’s to warm up at the end of a cold day, because you want a cozy drink or simple to satisfy your sweet tooth, this Raspberry Hot Chocolate is the perfect warm drink to savor! 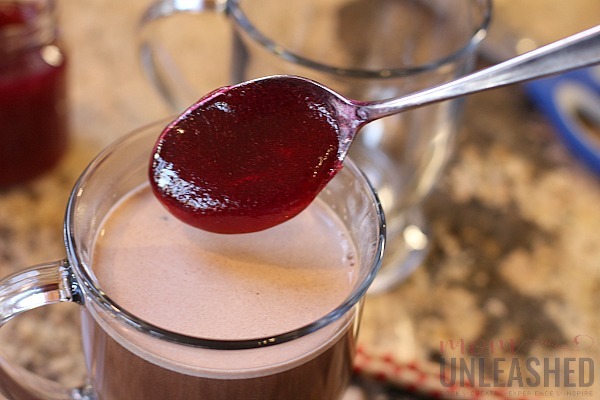 Are you ready to try this delicious Raspberry Hot Chocolate for yourself? 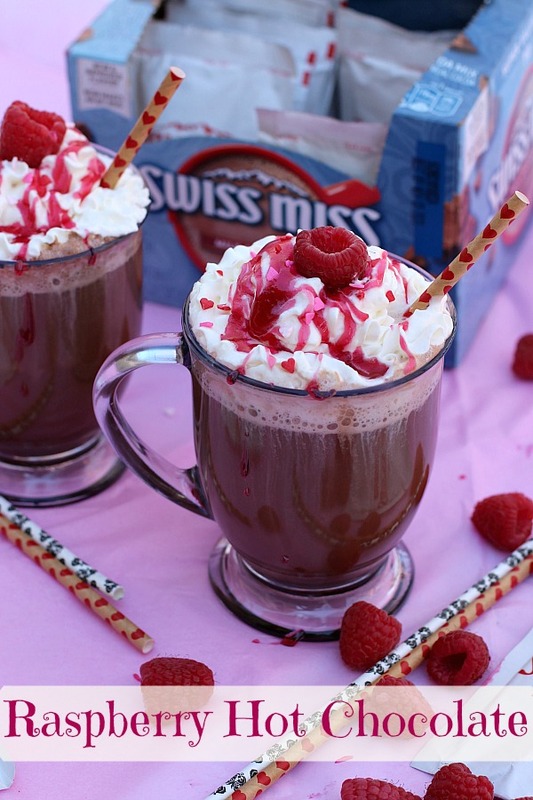 Start by heading to Walmart today to pick up Swiss Miss Milk Chocolate Hot Cocoa Mix. With it’s rich and creamy flavor, it’s a 99,9% caffeine free and gluten free drink that’s sure to warm up your winter! But wait! If you want even more delicious hot chocolate recipes, be sure to click here for tons of fun, new recipes for the whole family to try! 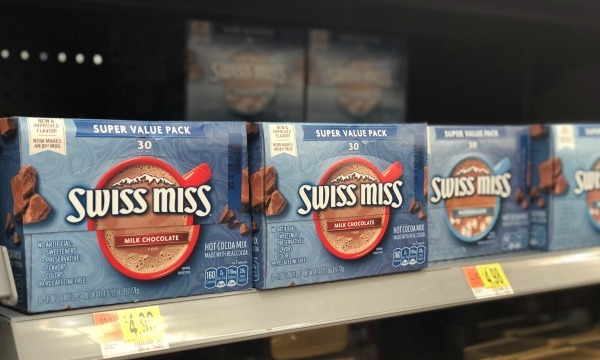 Then head to Walmart today to pick up a 30 pack of either Swiss Miss Milk Chocolate Flavor Hot Cocoa Mix or Swiss Miss Marshmallow Hot Cocoa Mix to create the perfect drink to help you stay sweet all winter long! 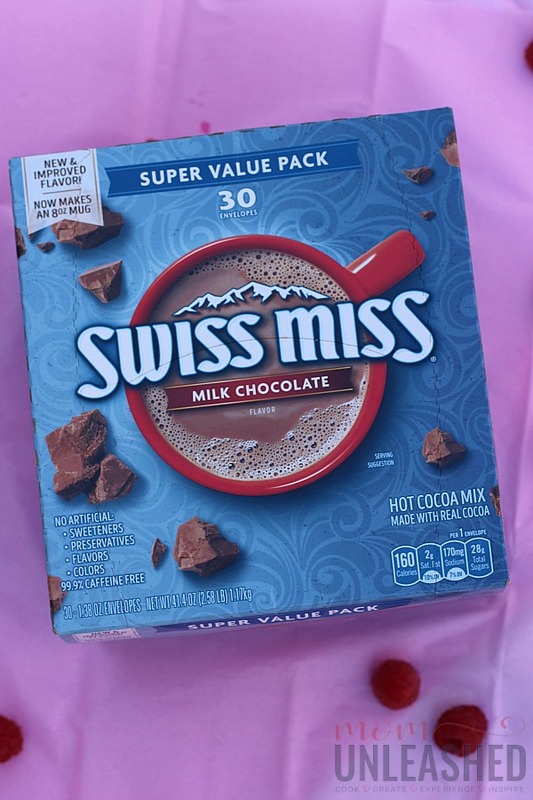 Now tell me, what’s your favorite way to cozy up with a mug of Swiss Miss? Ooooh I have never had flavored hot chocolate before, but this sounds SO good. Raspberry and chocolate go together SO well! Oh yum, I need to try hot chocolate this way. I never have, but I’m sure I’d like it. I’ve always been a fan of raspberries. I am a big fan of hot chocolate and this would be different and sounds wonderful. 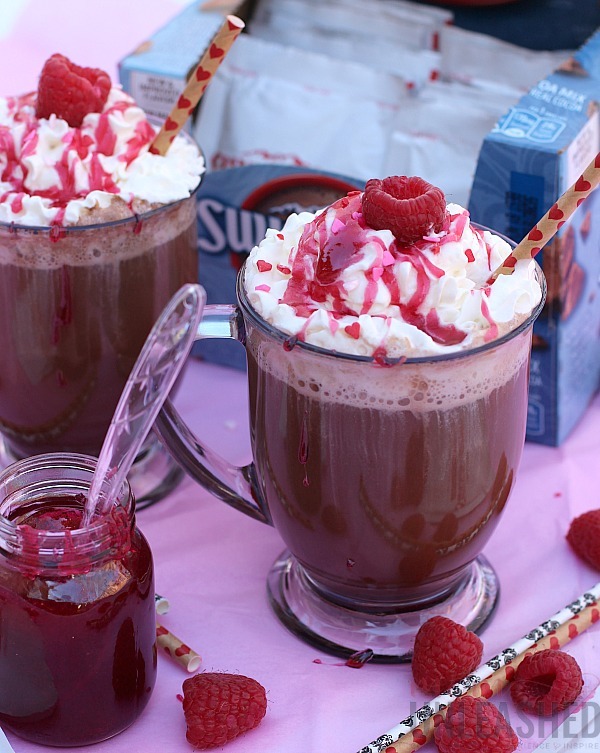 My daughter would totally love this hot chocolate anything with raspberries and she is wanting to try it out. I need your Raspberry Hot Chocolate in my life! It looks so good and perfect for Valentine’s Day. We have warmed up rather quickly her in South Carolina but I will save this for our next burst of cold weather. My little ones love hot chocolate and I like the raspberry twist. Love this spin on a traditional hot chocolate. I’ve been drinking a lot of it lately, it’s so good. You did such a great job making the most delectable cup of hot cocoa! I love the simple raspberry syrup you drizzled on top. My husband would enjoy this a lot and allow me to spoil him on Valentines for all the nice things he does for my son and I. Say goodbye to normal hot chocolate! This looks exciting and delicious! I can’t wait to make it! This recipe looks so yummy and is perfect for Valentine’s Day. I would love to make this for my family. It would be perfect for movie night this weekend. I’ve never heard of this combo before. I’m not a huge fruit and chocolate fan, but I bet my kids would love it. Oh wow! I love this so much. I like raspberries and here is a new way to enjoy them. Now, all I need is a fireplace and a cozy throw. Oh my! This Hot Chocolate sounds and looks AMAZING!! I need to try this ASAP!! 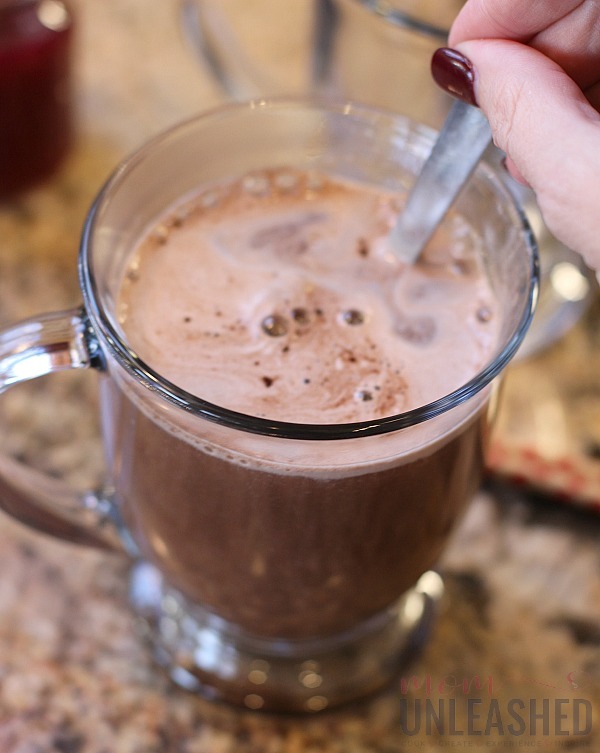 This hot chocolate recipe is so creative! My husband loves anything fruity so I am sure he will love this. If somebody offers me this, I will do a happy dance lol. I love this brand, it’s the one we always buy. I’ve never had hot chocolate like this but it sounds tasty. I do like raspberries! You had me as soon as I saw the picture! I love flavored hot chocolates! I can not wait to try this one out! My kids will be so excited because they love raspberry! 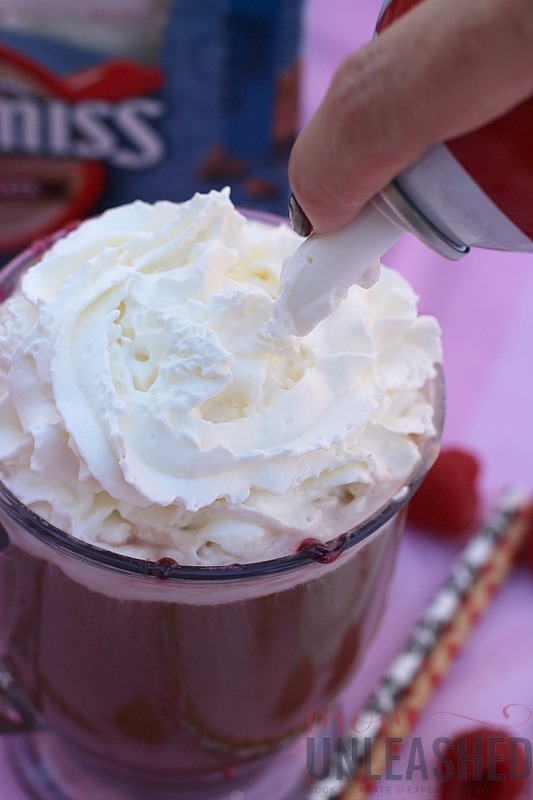 This raspberry hot chocolate is what winter dreams are made of. So rich and dreamy!